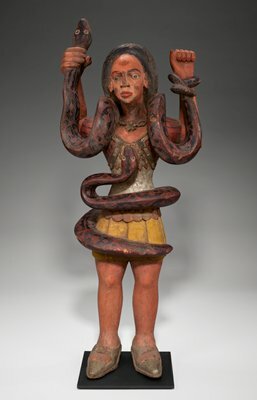 Beautiful, seductive, powerful, and fearsome—that’s Mami Wata, a water spirit usually represented as a snake charmer or a mermaid. Her name is derived from the pidgin English for “Mother of Water,” and she is an auspicious yet ambiguous being of great spiritual power. Associated with health and wealth, love and good fortune, she is celebrated throughout Africa and the African diaspora.